This is a three bedroom, Master bedroom has king-size bed, 2nd bedroom has full-size bed, 3rd bedroom has 2 twin beds, and the sleeper-sofa has a queen-size bed. 2 baths, fully furnished condo on the Gulf of Mexico.The kitchen is ready for some home cooking, just bring your food. You have your own private balcony for watching that morning sunrise or sunset. New Appliances in the unit, flat screen TV's, refrigerator, stove, and a new updated bathroom. The Seaside Beach condo was in a great location. 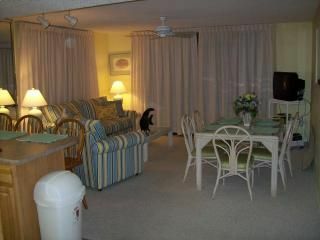 The Seaside Beach Condo was very comfortable and plenty of space for the five of us. The washer and dryer was convenient. We loved the wrap around deck. The property was well maintained and the guard out front was very nice we liked that no one could get in without going through the gate. I found the words immediate removal from the property way over used! It gave the whole experience a feeling of constant threat. I’ve also never stayed anywhere where I had to go buy more trash bags, soap, and toilet paper!!! That was totally ridiculous. The remotes in the living room needed batteries and the ceiling fan in the living bing room was so nasty you could plant something on it. The condo itself was nice but we won’t be renting there again. And for the first time EVER in my renting condos, I didn’t get all my deposit back. The damage claims they stated were grossly wrong! Never have we been accused of such. Unfortunately, you rented from an owner that has their own personal cleaners not a company. This woman only cleans for us, and when she called and sent pic of what the floor looked like and I quote “the people were very ROUGH on the condo.” It was pretty disappointing. You were charge $75 to clean carpets and $16.50 for a new trash can since our looked like it was used for Home Plate in Baseball. So out of $350, not too bad. I WOULDNT EVER rent to this lady or family again. It’s so nice that owners get to rate the renters now, so other owners can BEWARE! If you want your belonging to be treated like trash, this is the family. Tons of restaurants and grocery shopping nearby. Guard shack clearance to access property. All condo rooms are spacious and comfortable. And oversized balcony on corner unit includes outdoor table and 6 chairs. Breakfast bar at counter seats 4 and indoor dining table and chairs avail for overflow. Our condo was BEAUTIFUL and the view was everything we wanted!! Plenty of room for everyone. Melissa was very helpful and available to answer any questions if asked. I recommend staying here.. The white Sandy beach was perfect!! Thank You! We are glad you had a great time. The accommodations were clean, has a nice view, and good location to attractions. Beach is easily accessible and staff was friendly. The water pressure was awesome. There was minor things such as one door did not lock on one of the bedrooms. I specifically didn’t feel it was anything that needed addressing during our stay. I was concerned about the code to access our unit after reading a review made by a previous renter. We had no problem putting it in or changing it to a simple code we could remember. A stain was found on a comforter that required dry cleaning. We didn’t notice it until I made the bed like morning # 3 (I was on vacation- no judging). I honestly didn’t notice it when we got in bed the first night but can’t say one one of my nieces didn’t get jelly or something else on it when visiting from another unit at the condo and just didn’t say anything. So I have no complaint for the cleaning fee. I’d have to agree that if I didn’t ask about it when I seen it and cannot know for a fact it didn’t get messed up while we were staying.... overall great place, location, beach access, and would recommend staying. Our stay at this wonderful condominium was perfect. The views from the room were exactly what we were looking for. The condo itself was so spacious and had a very well stocked kitchen (which is important to us because we like to cook)! It's so close to stores, shops, etc. too. I would recommend this condo to anyone desiring a lovely 3 bedroom for a great price in a great location. center is close by, antiques shops, boutiques and souvenir shops. There is a $22 parking fee which is required by the association that you must purchase upon arrival. This is not part of the rental rate. You will also be signing a contract with us, the owners.